A category group object is a collection of categories, made up of URLs, domains, phrases, lists of file types, security rules, or any combination of these. Guardian uses these groups in web filter policies to determine if a user should be allowed access to the content they have requested using their web browser. 1. Go to the Guardian > Policy objects > Category groups page. • Tenant — Optionally, select which tenants use this category group .Note that only those tenants selected can use this category group. Specifying the tenant enables your Smoothwall to apply network and web filtering permissions to users coming from different tenants with usernames which are the same. 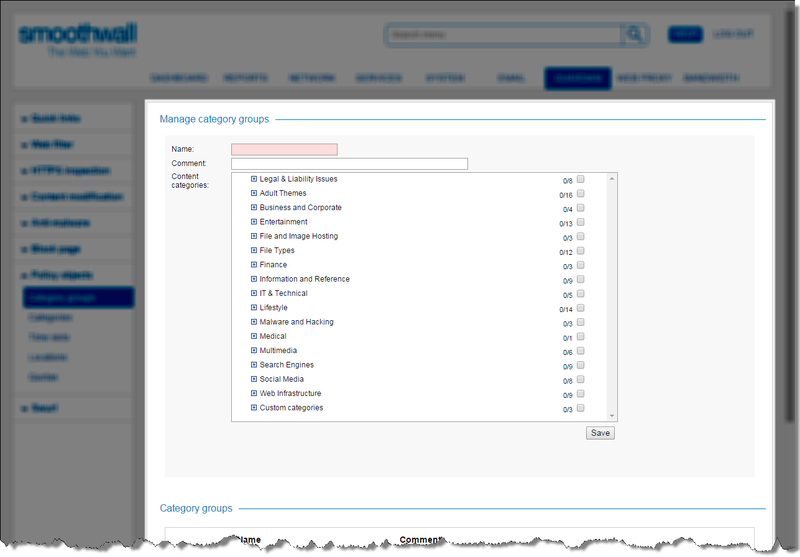 To create a category group for all tenants, leave the Tenant drop-down as All. Note that an All Tenant category group can only be administered by the central administrator, but can be used in any tenant's policy. Tenants are only available if you have the correct Smoothwall license type and they have been configured on the System > Administration > Tenants page. For more information about licensing your Smoothwall, contact your Smoothwall representative. • Name — Enter a meaningful name for the category group. • Comment — Optionally, enter a comment to make it easier to remember what the category contains. • Content categories — Select the content you want to include in the category group object. Click [+] to access and view any sub-categories available. If you are using a Multi-Tenant configuration, tenant-specific content categories are prefixed with the tenant name. The category group object is saved and added to the Category groups table. Note: The advanced view option is deprecated from the Carisbrooke Release onwards. 1. Go to Guardian > Policy objects > Category groups . 2. From the Category groups panel, click for the relevant group. Guardian displays the object in the Manage category groups area. 3. Edit the configuration as required. For a detailed description of each setting, see Creating Category Group Objects. Note: If you are using a Multi-Tenant configuration, you cannot change the tenant assigned to a category group, as that group may form part of a policy which is tenant-specific. Note: The advanced view option is deprecated from Carisbrooke Release onwards. Existing category groups that made use of advanced features will maintain .their configuration, and can be edited. However, any advanced configuration will be converted to non-advanced settings when saved. 3. When prompted, click Delete to confirm the deletion. Note: You cannot delete a category group object if it is in use in a policy. You must first remove the object from the policy.